Clarinetist Eddie Daniels and pianist Roger Kellaway have been both revered and sublimated by critics and listeners during their long and sometimes obscured careers. Make no mistake, though -- they are great musicians who somehow do not get the credit they deserve as true jazz masters. When Daniels has played more commercially oriented music, he's branded a sellout, while Kellaway's profile is so low-key, he's practically off the radar except when releasing a recording. Fact is, Daniels is as limber, facile, tuneful, and literate as any clarinet player on the contemporary scene, while Kellaway's understated brilliance is balanced by a sense of wonder and empowerment tempered by a veteran's common sense and deep wisdom. Both have made important strides in recent years to change minds and hearts with several very fine efforts in the modern mainstream idiom, but these duets recorded live at the Jazz Bakery in Los Angeles have to be a high watermark for them, individually and together. All of the thin veils and veneers are torn down, as the two get to the meat and potatoes of these six standards and four originals, while also pulling out all the stops and digging into the main principle of jazz -- improvisation. No prior rehearsal and the use of basic charts as frameworks set this program apart from many others, as calculation is thrown out the window and standardized deviation is the new norm. This sense of taking poetic license and adopting reckless abandon is most evident on the counterpoint intro setting up the lengthy version of "I Want to Be Happy," a giddy, playful, even clownish derivation leading into spontaneous tempo changes and eventually a settled light swing. "After You've Gone" similarly reflects this sense of play in a fast improvised chase scenario, very much gone, made up on the spot, and truly fantastic. Cleverly interpreting Tomaso Albinoni on "Adagio Swing," the duo freely takes his theme liberally and literally to a developed modal arena quite unlike the Italian operatic Baroque original. "I'm Getting Sentimental Over You" is bouncy off the bat, with the sprightly clarinet of Daniels and Kellaway's hopping piano both chock-full of soul. Kellaway's composition "This Is the Time" goes deep into the midnight-blue spectrum as a quirky stalking film noir dance that is more written and executed than made up. "Slow Dance" by Daniels and Hoagy Carmichael's "New Orleans" go to the softer side, the former handling the pristine end of understated romance, the latter a spacious and sentimental post-Katrina elegy. This is a wondrous duet date featuring extraordinary musicians taking chances and thankfully succeeding on all levels, not the least of which are in the enviable elements of pace, placement, and depth. If improvisational jazz is something that piques your interest, you might want to take a look at A Duet Of One, a new album now out on the IPO Recordings label. It's a deceptively simple pairing of clarinetist Eddie Daniels and pianist Roger Kellaway, recorded live at the Jazz Bakery in Los Angeles, but the music itself is anything but simple. Instead, it's a collection that serves notice that the two instrumentalists are among the best around. I reviewed an album by Daniels in 2007 and one by Kellaway in 2008, but a combination of the two virtuosos is something new for me. Using only basic charts as a framework to support their stunning improvisational efforts, they have created a listening experience that's as close as possible to being there. I found it to be a very intriguing sound and came away with added appreciation for the skills of the artists. The collection of ten tracks includes both standards and newer pieces written by the duo themselves, but it hardly matters because the level of improvisation makes even familiar pieces new and different. Whether it's a delightful and playful take on an old song such as "After You've Gone," or Daniels' own gorgeous and lyrical "Blue Waltz," the two musicians keep the listener guessing. Even the opening track, "I'm Getting Sentimental Over You," a tune better known as Tommy Dorsey's theme, is completely transformed. Instead of a lush big-band sound driven by a mellow trombone, we get the simple intimacy of a clarinet and piano playing off each other. Good stuff. Every track on the album has something to recommend it, but my favorite was probably "Adagio Swing," Daniels' reinvented version of an operatic piece by Italian Baroque composer Tomaso Albinoni. It's a good bet you won't find that on every jazz album. Daniels and Kellaway have generated something special with A Duet Of One, and should be applauded for not only continuing to grow as musicians, but for proving that the music of today's jazz stars can still surprise. A Duet of One has a unique charm of its own, at once restrained, lively, full of zest, and also, highly creative! With the magic clarinet of Daniels and Kellaway's piano in syn, and lovingly so, this is a fine example of how well the clarinet and piano can carry an extended and imaginative jazz session. The songs will delight the jazz listener. Among the many gems in this CD collection are found "I'm Getting Sentimental Over You," "Slow Dance," "Adagio Swing," "I Want To Be Happy," "New Orleans," "This Is The Time," "After You've Gone," "Blue Waltz," "Love Of My Life," and the complex "We'll Always Be Together." "This Is The Time" and "We'll Always Be Together" are wonderfully complex in their open approach and broad themes of color and tone. "We'll Always Be Together" is certainly worthy of jazz radio play time, as are all the songs in this fine CD collection. Everything about this CD is memorable. The liner notes were written by Paquito D'Rivera, and his comments are insightful and make for enjoyable reading. This CD collection was recorded live at The Bakery with photography by William Claxton. Every performance is topnotch. Highly recommended. If you are looking for great entertainment combined with great jazz musical expression, this A Duet Of One is a fine choice for your home music library, and as a personal gift for a friend. You might suggest to your local public library to place an order for this CD for its jazz listening patrons. Putting together clarinetist Eddie Daniels and pianist Roger Kellaway may be a no brainer, and if so, good. The both of them got together for a live performance that ended up becoming A Duet Of One IPO), signifying the fact that when the both of them play together, it is as if they are one being, and that is definitely true here. Both of them at times sound worlds away from each other, but it has the feel of other similar jazz duo albums where the listener is able to place an emphasis on just two musicians, jamming and having fun. When you hear the 8-minute “I’m Getting Sentimental Over You”, it reminds me of two best friends getting out of band class after being stuck in there for hours without an instruments. What you are also hearing are two musicians who know these songs inside and out, but are free to paint out of the picture which doesn’t change anything from the original piece. You’re also hearing appreciative audiences who accept this and can’t be nothing but amazed by what they’re hearing and seeing. As they go through “New Orleans”, “I Want To Be Happy”, “After You’ve Gone”, and the touching Daniels piece “We’ll Always Be Together”, it’s much more than friendship and love of music between the two, and while it may be just that, the knack for them to go in and out of the comfort zone of these songs throughout the album is too irresistible to ignore. If you’ve ever seen a Daniels/Kellaway show in the last twenty years, you know what to expect. Or maybe “you know not to expect the expected” is a better way of putting it. This is of the moment, spontaneous jazz that makes you wish all jazz was this moving. 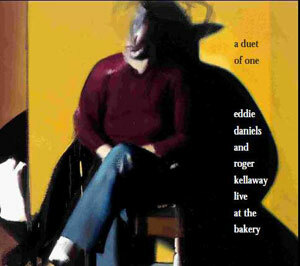 EDDIE DANIELS & ROGER KELLAWAY/A Duet of One: Both Daniels and Kellaway have been making a series of amazing jazz dates for IPO so it was just a matter of time before someone realized they should play together, as they have been over the years anyway. This pairing of them and only them at The Bakery is simply them kicking it out on a set of duets that will make you wonder what you are listening to and what planet it‘s from (in a good way). With the kind of simpatico that makes you think they are playing from one mind, this is pure music loaded with pure enjoyment. This is what a pair of cats at the tops of their games sound like when the stars are really aligned. Hot stuff.